Rochester, a rural town, is 165 km north of Melbourne and 25 km south of Echuca. It is on the Northern Highway and the railway to Echuca, and the main section of the town is on the west side of the Campaspe River. In 1846 John Rowe took up a pastoral run along the Campaspe River and later built an inn east of present day Rochester. A small settlement formed around the inn and was known as Rowe’s Camp. A township was surveyed at Rowe’s Camp, and was named Rowechester. In 1855 the name was shortened to Rochester. Nine years later the railway line from Bendigo to Echuca was opened through Rochester, and the year after that (1865) a school was opened for the district’s settlers. The Rochester district was part of the Echuca shire (1871) which extended eastwards to Yarrawonga. Within 15 years a series of severances reduced Echuca shire to an area which became Rochester Shire in 1909. 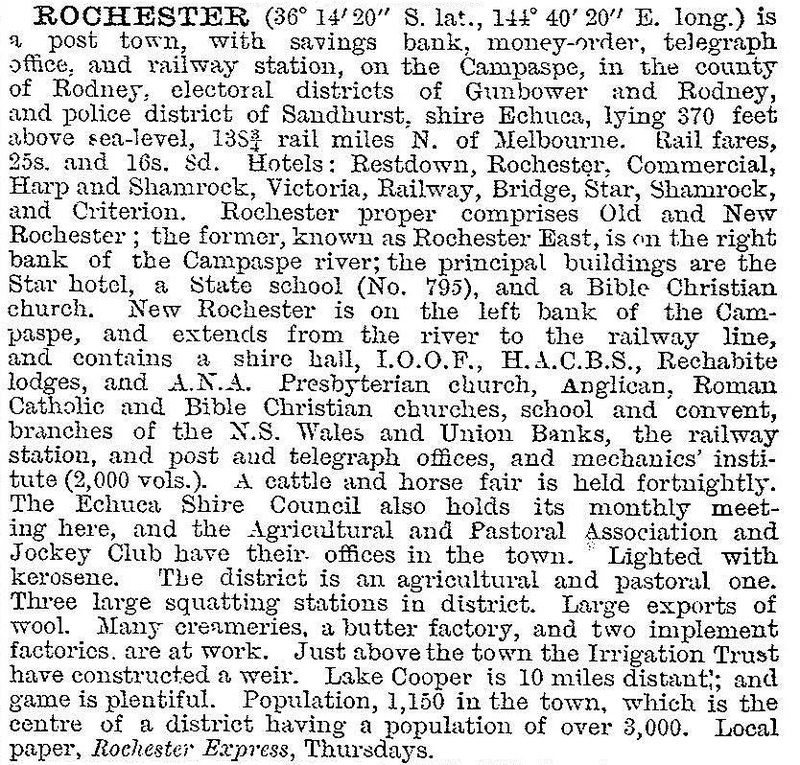 As Echuca borough was a separate entity, Rochester became the shire’s administrative centre by 1880. The township moved from east of the river to develop around the railway station on the other side. It had Presbyterian and Bible Christian churches, the shire hall, a flour mill (1868), bank branches, several hotels and an array of shops. In 1893 the Rochester Waterworks Trust was formed to draw irrigation water from the Campaspe River. A greater change to Rochester’s agricultural prosperity came with the extension of the Waranga Western Channel by the State Rivers and Water Supply Commission in 1909. It crosses the Campaspe River about 2 km north of Rochester, extending irrigation westwards through the former Rochester shire. Dairying and fruit and vegetable growing were added to the agricultural economy. A cooperative butter factory was opened in 1913. Between 1910 and World War II Rochester’s population was about 1500 people. It became a district centre for the irrigation area to its west, notwithstanding the growth of Lockington. A municipal saleyard was opened (1911), a new bridge was built over the Campaspe River (1915), the Strand picture theatre was opened (1918) and Rochester’s football team became a force in the Bendigo League after joining in 1915. In 1943 the Advance Rochester and District Association was formed, bringing a Housing Commission estate and a War Memorial hospital (1952). The Returned Services League had opened a memorial hall in 1920, and in 1952 it acquired a two storey mansion, Burneway House, for a war veterans’ home. A program of concrete kerbs and footpaths was begun in 1954. Rochester has bad floods every five or so years, and it was hoped that the Eppalock dam upstream on the Campaspe River would reduce their severity. While the stored water increased irrigation it left it at some risk of water table and salinity problems. In September 2010 and again in January 2011 many parts of regional Victoria experienced widespread severe flooding. In January 2011 hundreds of people were evacuated from Rochester to Echuca, including 65 acute and aged care patients from the hospital, after the Campaspe River reached a record height of 9.5 metres, in excess of the previous record set in 1956. Floodwaters covered 80% of the town with 1200 properties affected, four times the number in the September 2010 flood. Following the floods, a new flood levee was planned 4.5 km south of Rochester. Flood-damaged clubrooms at Rochester's main recreation reserve were replaced on higher ground. Rochester has had continued population growth during all postwar censuses until 2011. It has State primary and secondary (1957) schools, a Catholic primary school, an agricultural and pastoral association and showground, several sports ovals, a golf course, sports clubs, a racecourse, a swimming pool, a caravan and camping ground and a livestock saleyard. Among the four large verandahed hotels is the two storey Shamrock (1912), listed on the Register of the National Estate. The original shire hall (1892) and the first primary school (c1870) are also on the Register. The court house (1889) is on the Victorian Heritage Register. There is a museum dedicated to the endurance cyclist, Sir Hubert Opperman (1904-96) who was born in Rochester. Rochester primary school had 176 pupils and Rochester secondary college had 464 pupils in 2014. Rochester’s industries include the Murray-Goulburn Cooperative milk and cheese factory, makers of silos and irrigation equipment and engineering works.